There are a variety of options to view and read a PDF on the iPad. 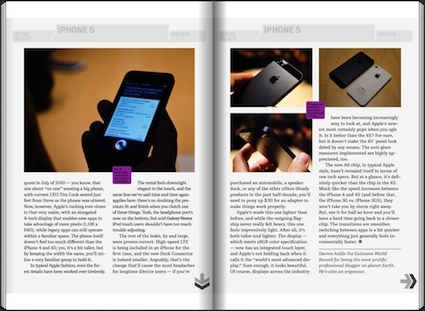 Some, even add some enhancements around graphics for page flipping like the Apple iBooks app. 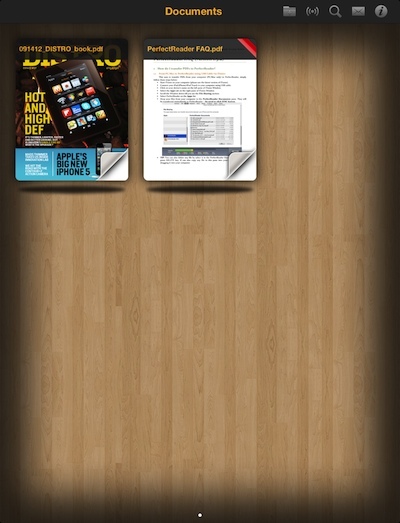 PerfectReader Pro is a new solution being talked around the office as a way to make PDFs actually usable on the iPad. Usable enough that they are replacing other ebook format styles. Any device can open a PDF, but unless the files in on a desktop, normally a mobile PDF viewer is just a static document that a person has to swipe through or maybe jump to a page they think was close to where an answer might be. Difficulty in managing PDFs while mobile means that information is converted to other file formats when being loaded onto a iPad, iPhone or Android device. PerfectReader Pro seems to have thought through both the pleasure readers and resource need users, giving both a single place to keep their materials. The app is Universal so buy once and use on both your iPad and iPhone. 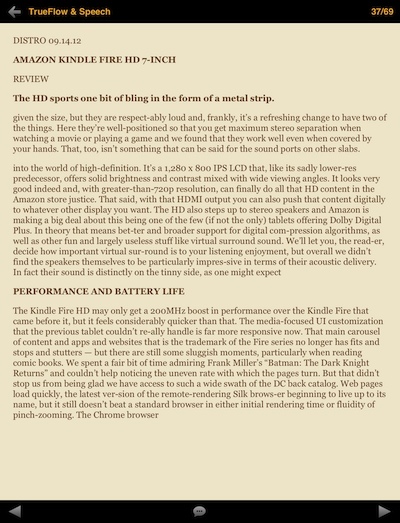 The PDF is read side-to-side via page flips, not up/down like many other iPad PDF readers. Tap the corner of pages to flip pages forward/backward. 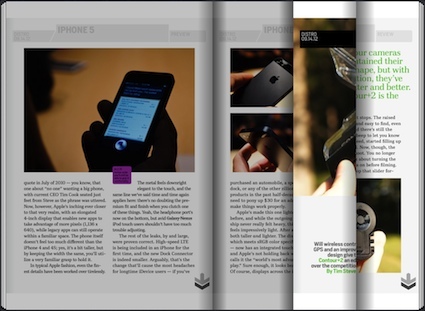 PerfectReader does offer page flipping graphic if you choose to drag a page. Yes, you can read your PDFs in single page portrait view too. Tap the page in either view for access to tool buttons across the top and a progress slider across the bottom. In the normal view above, tap the lightning bolt icon to be taken to a text only view. A feature we didn’t see anywhere is available from this view, tap the speech bubble at the center bottom of the screen… and the text will be read to you. This feature is something found on a Kindle device for Amazon mobi format ebooks only, not found in the iPad Kindle book reader. Don’t have time to read a long article? 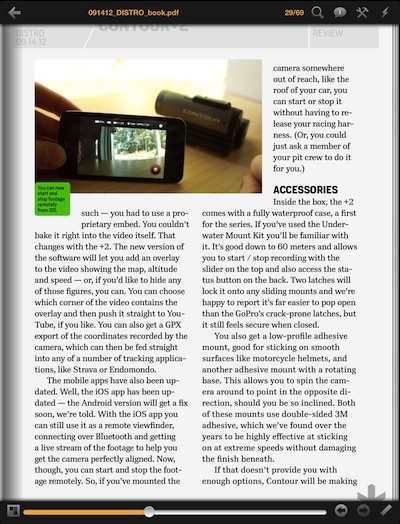 ‘Print to PDF’ the article, send it to PerfectReader on the iPad and listen while on the go. Searching documents is the whole reason we went digital with reference materials. The general method to support this is an app takes you one by one through the instances of the word. PerfectReader Pro offers a list view of the search results with page numbers and reference. If there is a ebook outline, swiping the page will take you to that info too. The views are accessible through the magnifying glass icon in the upper right corner. To collapse the view, lower the keyboard and tap the square icon in the lower left corner of the screen. A library view is provided that has the option of creating folders that can have documents added/moved between. PerfectReader Pro offers your iPad a network ID solution so you can connect to your desktop for easy drag/drop install of PDFs. A few folks are using this as a method to dump their PDFs into the App. Most popular though it have all of our PDFs in Dropbox, then selecting the file via the free Dropbox app, and choosing to ‘Open in’ PerfectReader Pro, allowing for up-to-date PDFs no matter where we are.